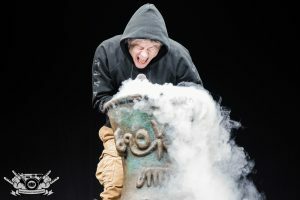 On Wednesday, June 7th, Iron Maiden brought their “Book of Souls Tour” to the Prudential Center in Newark, NJ. Fans from all over the world came out to support the heavy metal legends, who are still touring behind their 2015 release The Book of Souls. For a band that started out in 1975, Iron Maiden has stood the test of time. Wednesday night’s show proved once again why the band is one of the all time greats. As every Maiden fan knows, as soon as UFO’s “Doctor Doctor” hits the speakers, it’s go time. The night kicked off with a short animated video segment which led directly into “If Eternity Should Fail.” The song started with lead singer, Bruce Dickinson, perched above Nicko McBrain’s drum kit singing into a smokey cauldron. As the intro to the song finished, the stage went black and a huge blast of pyro went off and the entire band came running out on stage. It was from that moment on the energy didn’t let up. The setlist was heavily focused on songs from The Book of Souls album, which seemed quite popular with the audience. Each song throughout the evening had a different surprise for the crowd. For instance, the backdrops changed for almost every song and would display a different picture of the band’s mascot Eddie or an image that tied in with that specific track. When the band played “The Trooper,” Dickinson wore a military outfit while running around the top catwalk waving flags back and forth. The show’s spotlight wasn’t just on Dickinson throughout the night. Each of the other band members brought their own unique energy to the show. Guitarist, Janick Gers was one of the most fun to watch on stage, while he threw his guitar around his body and did crazy poses all night. Bassist, Steve Harris was running and jumping all over the stage throughout the 15 song set. The other two guitarists Dave Murray and Adrian Smith did their share of shredding on stage leaving the guitar fanatics in the audience mesmerized. Last but not least, there’s Nicko McBrain one of the best drummers of all time. 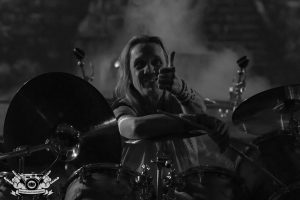 For just turning 65 years old, McBrain hasn’t lost his touch. Hidden from the audience most of the night behind a fortress of golden drums, McBrain was flawless. When the video cameras panned to him, he would have a giant smile on his face. For a band that is made of 6 guys who are in their late 50s and early 60s, they certainly don’t show their age. During the song “The Book of Souls,” the band’s mascot Eddie came out on stage. Standing at well over 9 feet tall, Eddie made his way around the stage interacting with the band. Guitarist Janick Gers ran back and forth between Eddie’s legs. After Eddie had his fun with Janick, he made his way over to Bruce who fought with him and ripped out his heart. With the heart in hand, Bruce ran over to the cauldron and tossed it in there. He then took it out and squirted the blood from the heart at his bandmates before tossing it into the crowd. Some lucky fan in Newark left with a piece of Eddie. The night ended with a three song encore which consisted of “The Number of the Beast,” “Blood Brothers,” and “Wasted Years.” If there’s anyone who’s on the fence about what tours to catch this summer, this is one you simply cannot miss. If the show had to be described in one word, it would be “Epic.” There’s no better way to describe Iron Maiden’s show. These musicians simply create something special that no one in the audience will ever forget.